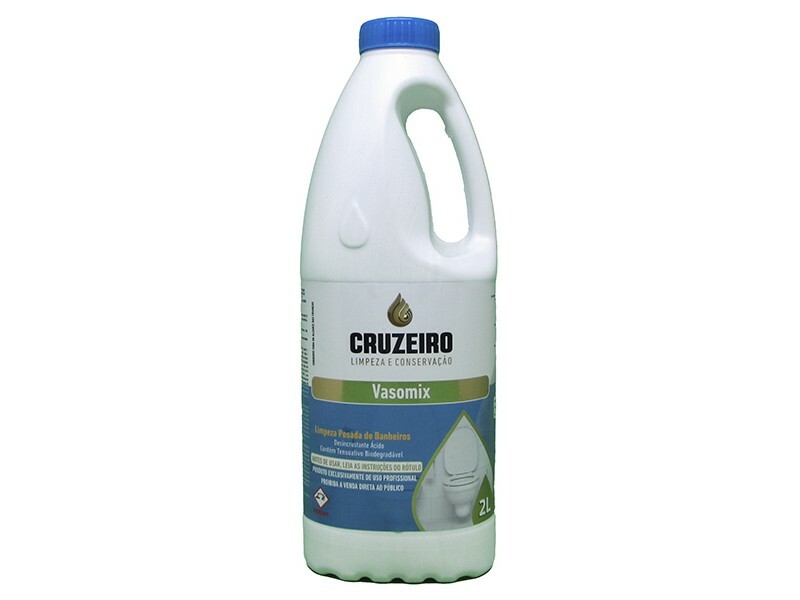 INDICATED: The Cruzeiro Bathroom Cleaner is indicated for har cleaner in the bathrooms, to remove dirties on the toailets, and sinks. WARNING: Don't use it to disinfection of food. Don't eat, drink or smoke while the application. If it is not used correctly, it causes severe skin burns and eye damage. Causes serious eye damage. HOW TO USE: It is recommend to test it in small areas first before use the product. Before use it, wet the surfaces to be cleaned. Dilute 1 liter of Bathroom Cleaner (Vaso Mix) for 1 liter of water and apply it in the entire surface of the toilet or sink. Leave it for a few minutes and rinse it with water. After that, wasj the toialet or the sink, with water or detergent to neutralize the surface. In case of stains more difficult to remove, apply pure on the stain, wait a few minutes, rub with a brush and then rinse with water. Then wash the toilet or urinal or sink with water and mild detergent.